This topic contains 2 replies, has 1 voice, and was last updated by Grégory MARTIN 1 year ago. Description: After the passage of Cyclone Berguitta, a ‘sea’ of garbage has been found floating near the Caudan Waterfront (https://www.youtube.com/watch?v=-xBF25KCRa8). Garbage and plastic waste have also been found to clog and block our drainage systems, causing major flooding in the homes of many Mauritians and with the excess rainwater also spilling onto streets. One major issue in Mauritius is the use of plastic water and soft drink bottles which are discarded after use and often find their way along roadsides, in rivers and ultimately into the sea. Unconsciously, our plastic waste are contributing to the Indian Ocean Garbage Patch, which was discovered in 2010 by Marcus Eriksen. He reported that water samples collected between Perth, Australia, and Port Louiscontained plastic (https://www.sott.net/article/212814-New-garbage-patch-discovered-in-Indian-Ocean). Polypet Recyclers Ltd recycled around 80 tonnes of used plastic bottles in 2008, turning them into granules or flakes. However, it was estimated that only 27% of used plastic bottles were recycled, which is a low rate if Mauritius aspires to become more environmental friendly and sustainable. Potential Solutions: One way to deal with used plastic bottles is to look at the feasibility of taking up a deposit refund scheme. The Swedish system covers both cans and bottles. It works by adding a small deposit to the cost of a drink which is refunded when the container is returned. 85% of plastic bottles and aluminium cans are recycled and reused. Now, the country is seeing the first trial of a similar deposit-return system for plastic bags. A deposit refund scheme is already in place for specific glass bottles in Mauritius. This scheme should be extended to plastic water and soft drink bottles, plastic bags and aluminium cans. The Deposit Refund Scheme is a great example of how a country can promote the benefits of recycling into everyday life whilst also having a positive impact on litter. The scheme has to potential to create new industries and investment in jobs and skills to process these valuable materials. Ultimately, we should aim to stop using plastic water and soft drink bottles altogether. How? Why not get inspired by Ooho! developed by innovative London-based start-up Skipping Rocks Lab. 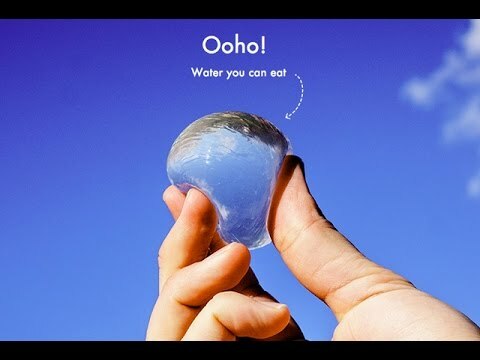 A clear, palm-sized orb that can be held in your hand that contains drinkable water. (https://i.ytimg.com/vi/qphMFhwDvI8/hqdefault.jpg). This soft, spherical container has zero plastic. Instead, it is held together by biodegradable material made from seaweed. These Ooho! water containers are cheap and sustainable to make. This is actually a good and workable idea which can be easily implemented with foreseeable positive, measurable and attainable outcomes. Solution à mettre en place ! Merci pour la contribution appuyés par des articles et des données.